Mars 160 crewmember Annalea Beattie. G'day. No wonder Mars is called the geologist's planet. Mars has many geological features that we recognize here on Earth, like ice caps, volcanoes, canyons and gullies, craters, hot springs, rift valleys, catastrophic flood features and so much more. We can imagine ourselves on Mars through virtual travel, but I'm always thinking about what will happen when get there. That's not far off. When we are actually on the Martian surface, how will astronaut geologists observe, document, record and relay multiple hypotheses about what they are seeing? In the science field, will we continue to rely only on cameras mounted on platform robots to provide the geological context so necessary to meaningful interpretation of the data and to sampling? Here on Earth, geological field drawing in field science in Mars-analogue environments is an iterative process of fieldwork, one that emphasizes the study of authentic phenomena in context, helping us to understand how Mars was formed, through terrestrial studies. On a space simulation, as part of the field science team of Mars 160 at the Mars Desert Research Station, I've been cross-trained as a hypolith generalist, and I'm the field artist. Drawing lichen distribution with the magnifying glass (as opposed to the hand lens). 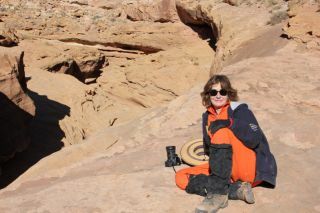 Framed by the science, I'm testing field drawing in the spacesuit in the Utah desert, in conditions analogous to those on Mars, because I want to know about how people will draw when they travel far into space. In the past few months, I've clocked up 40-plus hours drawing geology and biology in simulation on science EVAs (extravehicular activities). This testing of field drawing in the spacesuit is a comparative study set in two different kinds of deserts and conducted between two analogue research stations, the Mars Desert Research Station in Utah and Flashline Mars Arctic Research Station in Haughton Crater in the Canadian Arctic. By the time you read this, we will have completed phase one. My research addresses methodologies for adapting existing field-sketching skills to the analogue Martian environment to improve or make the best use of the data. Through scientific inquiry, I explore the tools, techniques, procedures and protocols which might be applicable to all future users in similar studies (the science operations side of things), while drawing in the spacesuit. And I try to write through these experiences, sometimes to you, sometimes prose, sometimes poetry. And as I said on fb, I love it. If anyone can pay me to draw rocks in a spacesuit as a job, I will quit work. NASA Desert RATS: I always imagine you out there in the desert somewhere; please call now. Using the magnifier to draw the degree of hypolith colonization on the underside of quartz pebbles. Geologists attest to the power of drawing. They are the ones who will defend observation through drawing (and note-taking) as key to field geology, not me. Talk to our field geologist, Jon Clarke. He says, "Field drawing is a way of capturing the essentials of a feature, be it an outcrop or a landscape, emphasizing what is of interest and de-emphasizing what is not. The act of drawing engages the mind's ability to conceptualize and reinforces your understanding." Drawing quartz distribution in the quadrat. There is no doubt that to draw the geological landscape is to recognize somethingabout where you are. Drawing thinks through materials to build upon situated knowledge around contentas a matter of course. There is no way it can do anything but. This is the nature of drawing . Drawing helps translates our experiences into thought. Artists already know this, but field geologists also completely get it. When we draw, we see implicitly with and through form in relation to ourselves. In other words, directly and immediately, we see potential in everything before we even start to think about it. Drawing of ripples in a modern dry creek bed, given to geologist Jon Clarke to annotate as blind data. And just a word on photos. Have you ever read a paper or a book and used a highlighter pen to mark out different sections? And all you end up with is lots and lots of highlights? It's a bit of a stretch, but in a similar way, if you take a dozen photos of a surface, these are images that still need to be interpreted as data by geologists. For instance, in the case of the ExoMars PanCam, images are made into 2D or 3D maps that have to be looked over and calibrated, manipulated by geologists using computer tools to view points of interest. You have to know what you are looking at and where to find it. The point is, it's very easy to miss something — for instance, possible microbial mats in Gale Crater or geyserites in Gusev Crater. Nothing replaces immediate perception. And, 3D or not, photos flatten information. Field drawing is not like that. Like field science, it is inherently exploratory. To draw a geological outcrop or lichens colonized on a piece of sandstone requires an engaged and active process of observation that thinks through the materials and tools of drawing to causally relate phenomena. Drawing the cross-bedding in a paleochannel. While drawing sharpens perceptual capacities and develops spatial knowledge, it promotes good data recording, maximizes retrieval and ties context to meaningful sample interpretation. Our principal investigator for Mars 160, biologist Shannon Rupert, makes a good point. She says many field scientists use field drawing to document a site, making it easier to return to the same sampling site time after time. Biologists sample the same spot again and again and may need their own form of drawing to navigate back to a particular spot. "Photographs can help, but it is the drawing that allows us to zoom back into the exact spot we seek," Shannon says. "I think this is an important argument for field drawing in space. It is one we noticed during Mobile Agents. Scientists are currently trained to do field drawing, and even the youngest on Mobile Agents have to adjust to not being able to do so. In the future, we will either need to find a substitute for this, or train our young scientists to look at the field in another way." Framed by the science, a key part of my inquiry is to shift perspectives about what it means to draw. In the spacesuit, I'm trying to create a set of tools and procedures that supports geologists to use their own observations and knowledge through drawing and field notes within the limitations of simulation. From my perspective, some of my drawings in the spacesuit are mediocre. Why am I mentioning this? I am always thinking about what makes a "good" drawing. But there's no point being too concerned about what it looks like. It's not about skill or me. It's about the context of the field site and getting the data. So please don't tell me you can't draw. Anyone can draw if they try. Yep, the value of field-trained geologists will be crucial for future planetary exploration on Mars. And artists. CRUCIAL. Drawing A: Detail from the disrupted sampling site (unsuited). Here's some very good news. To date, all the results from my tests on science EVAs indicate that there is very little difference between field drawing in the spacesuit and field drawing out of the suit. Drawing B: Detail from the disrupted sampling site (suited). Even without looking too hard, you can tell these drawings A and B are much of a muchness. There is little difference between the unsuited and suited drawings. (Before you say anything further, I know the scale is incorrect in the Drawing B, but that day I lost my ruler somewhere in the field). The important thing is that, even though the quality of the suited drawing may be slightly less (for instance, in terms of clarity of line and expression), and though comfort is definitely a factor (this can be overcome), and even if drawing in the spacesuit is a little slower (I managed to get a little more of the context in the unsuited drawing, and I'm still faster than a robot), basically the science return in terms of the data is the same. These results are consistent over many tests. Hard to believe, eh? It's a myth that field drawing is too difficult in the spacesuit. Astronauts will draw (and take field notes) on science field trips on Mars. With the right materials, tools and protocols, extraterrestrial geologists, constrained by bulky heavy spacesuits, will be able to able to interpret and evaluate a site using field drawing, as well as improvise and respond to the unexpected, just like they do here on Earth. There is no reason why not. Drawing honeycomb weathering populated by lichen. I'm only halfway through this research, so keep in touch. Surface investigations of Mars will require new tools and techniques for drawing in the field, and this is what I'm thinking about in the second phase of our mission. As well as the science, we're exploring the nature of exploration on our Mars 160 mission. I'm on the way to Australia now, back to those people I love at home. See you in the Arctic. Annalea Beattie is an artist and writer based in Melbourne, Australia, and her art practice is based on space science. She was recently elected a director of the National Space Society of Australia. Annalea is a member of The Mars Society's Mars 160 Twin Desert-Arctic Analogue mission, where her art-based research explores how observation is key to the role of all field geologists, including those on a planetary exploration crew. Follow The Mars Society on Twitter at @TheMarsSociety and on Facebook. Original article on Space.com.